I know what you're thinking: "Wait. Don't you mean Japonaise Bakery & Cafe?" No, I mean Cream Pan. Within the last week or so, Cream Pan -- the little bakery that begat Japonaise Bakery & Cafe and disappeared into its offspring's slick new digs last year -- has been reincarnated. In a sort of restaurant cellular mitosis, Cream Pan has now separated from Japonaise, doing business as its own entity with a new storefront and seating area two doors down. With the move, the Japonaise/Cream Pan organism has taken over its entire building; but the two are still conjoined in the middle by a single heart: its shared kitchen. Why was this necessary? Well, my guess is that Japonaise was getting too big for its britches. Since it started doing pastas, breakfasts and sandwiches, the line for the cafe dishes choked up the line for the pastries. On some mornings, there would be a traffic jam of people, most of whom didn't know which queue to be in, frustrating themselves and everyone else. Trust me: I've been there. Now that the problem is solved, you'll find me at Cream Pan, because while I like the breakfast specials, there's really one thing that keeps me coming back: The strawberry croissant ($2.20). It is easily their single best item. Heck, it's probably the best pastry in the whole of Orange County. It's a pastry perfect in conception, construction and execution. Nothing in its triangular, hand-holdable frame can be improved upon. The croissant flakes off in crisp, buttery sheets; the custard is as cool as silk; and the sliced strawberries are perkier than a giggly, doe-eyed anime schoolgirl. And of course, it's sprinkled with plenty of powdered sugar to make it look like you've just snorted some blow. 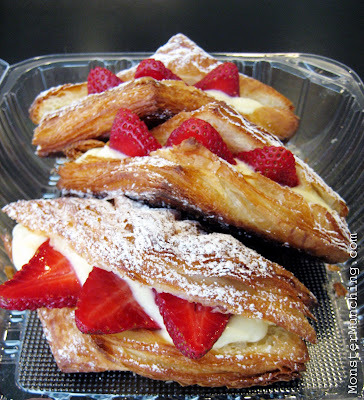 Japonaise's strawberry croissants are just as addicting. Now it's even easier for everyone to get their hands on this dessert drug of choice. But don't take this to mean that it will be available whenever you want a fix. As everyone who's ever been denied the pleasure of its wonders knows, these babies sell out faster than the newest model iPhone on Christmas Eve. Come the afternoon, their limited supply is history. I do have a better solution if you want to ensure your mouth gets its just desserts: their equally wonderful mini strawberry croissants. It's just smaller, bite-sized versions of the original, but it's just as awesome. The minis, however, are only available by special order and needs to be requested at least two days in advance. Pricing starts at $25 for an 18-count-tray. But trust me, in this Japanese bakery stock split, it's a wise investment. And if you show up at a dinner party or office potluck with them, you will be anointed the hero -- your reputation cemented as someone who knows where to get the good stuff. But who's to say you can't consume it all by yourself in a dark corner of the house when no one's looking? 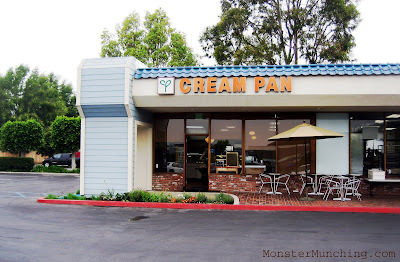 Oh gosh, I was majorly disappointed when Cream Pan was no longer. Thank goodness they've brought it back and made it separate from Japonaise! At first I thought I was reading a post which I have read before, but I was wrong :). The strawberry croissants look just as great as you describe them to be. The strawberries look fresh and the croissant is beautifully browned. They raised it up o $2.20 since you left for Ohio! But it's still worth it. The mini-croissants are smaller...I'd say about 40% smaller. So I suppose the price is adjusted accordingly. Plus you get a nice decorative tray along with it! If you ever come down to Tustin, you MUST MUST try them. I have actually tried to replicate it myself, using store-bought puff pastry dough, Jacques Torres' recipe for vanilla custard pudding, strawberries and powdered sugar...but it just wasn't the same. elmo, how is it taste when you compare it with portos? I've GOT to go there. I love the way the two are split now. It makes it so much smoother to visit. I just recently separated my Yelp reviews accordingly. Not as fond of Japonaise, now that we're calling it out separately. I find most of their food pretty bland. Portos is great all around. I love it. So is Cream Pan. But I have to say that I've never had anything like this strawberry croissant at Portos. 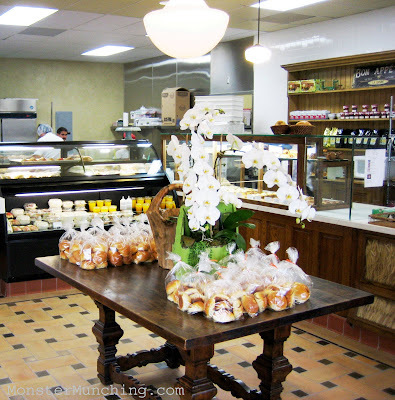 BTW, did you know that Portos will be opening a new store in Downey?! "And I guess you got me. You can be 'blue' too. ;)"
And from what you've described of their egg salad and other items, it looks like I have other things to try there besides the strawberry croissant. And blueberry?! When do they put that out?! I've never seen that there! the curry pan is crazy! And I usually can't stand Japanese curry. Put it inside a deep fried donut though: amazing! I don't like Japanese curry either but I may try the pan since you're endorsing it. The egg salad - the counter with the croissants usually has those sandwiches on their little golden buns (heh), like the chicken katsu or yakisoba - there should also be egg. You can also have it in the sandwich box, with the egg, tuna and ham. The egg... god, craving it now... but their tuna is also fantastic. Total simplicity but incredibly good. A-SO! Yes, I have seen the that weird yakisoba sandwich. I guess the shocking sight of it makes me blind to the egg salad and other goodies. One tip for the curry pan: You must have it with hot tea. Be it a Lipton tea bag, or a proper matcha green tea, the curry pan needs some sort of hot, scalding, slightly bitter liquid to help wash it down. Coffee, by the way, would taste nasty with it. we LOVE Cream Pan! & are thrilled with this change. Now getting our favorite treat will be easier than every! I love Japanese pastries! (Chinese, Korean and Filipino pastries, too) Especially with a nice cup (or can) of coffee. Easier access makes for more consumption! I prefer Asian pastries over American ones any day! i just found your blog today, and love it! I love the idea of a regional food blog. I went there on Thursday before heading to work and saw Cream Pan was where the Beads store used to be. Very cool! Me too! HA! I'm glad you found me. Yay! You know, Old Town Tustin is a really weird lil' bubble with some damn good food. Cat and I really like it. We get plenty of excuses to visit it now, since a friend of mine got a house two blocks behind Cream Pan. Old Town Tustin is a hamlet of good eats. Heck, the whole of Tustin is! My wife and I love Cream Pan. We used to go once a week, until things got too busy for us to. We still try to go as often as we can, though. We're very lucky, we only live five minutes away from it. My wife loves the pastries, I tend to lean towards the Japanese sandwiches, like the Yakisoba-pan. This new store is not so busy anymore. And I'm glad. Because when I wants my pastry, I wants it NOW! Oh!! Its damn good news for me that Cream pan is available now and that too separated from Japonaise. I’m looking forward to many such interesting news. The look is so attractive that I think I gotta go now. someone did bring them to a potluck and now we are hooked.... and happily so.